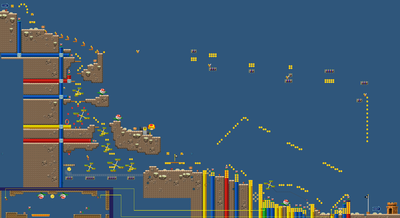 World 5-6 is the first cliff-based level in the game. This level features a lot of Rotating Platforms. The Piranha Plant is the most common enemy in the level. If the player flies into the air while as White Raccoon Mario, he can find some coins on top of spikes. At the beginning Mario goes down the cliff. There is a blue pipe with a Piranha Plant inside and some ? Blocks. The middle one holds a Fire Flower. Next is a stair-like orange platform area with a red Koopa Troopa on each platform. Below are two crossing blue pipes with Piranha Plants inside. At the end is a red Koopa Troopa between two Brick Block, one of which being a Coin Block that can become a Gold Block. Going down, there is a red pipe containing a Venus Fire Trap. Further down, there is a set of rotating platforms, with a blue pipe containing a Piranha Plant, and there is also a Big Piranha Plant. Even further down, there is a bigger set of rotating platforms, some Goombas, and a yellow pipe with a Red Ring above it. If the player moves right, they will find another Big Piranha Plant, but this one is guarding an ! Pipe that produces a Mega Mushroom. Down further, the player will find a red Venus Fire Trap pipe and some more rotating platforms, and will reach the bottom. The player must use these rotating platforms to get across, but the left one has a red Koopa Troopa on it. On the left, the player will find some bricks, a Star Coin, and a ! Switch. The switch makes red blocks appear below the rotating platforms. The player can then go right to find a checkpoint flag and some ? Blocks, one of which holds a Fire Flower. As the player proceeds to the right, they will find some Goombas and pipes, except this time, red pipes hold Venus Fire Traps, blue ones hold normal Piranha plants, and yellow ones are safe. Eventually, the player will reach a set of rotating platforms on a track, with a green pipe they can enter, a Big Venus Fire Trap, and more pipes below. After that, there is a Goomba and a Star Coin, but the Star Coin has stone blocks above it. The player must climb up the pipes to get to the Goal Pole. Star Coin 1: Just before the checkpoint, the Star Coin is seen to the right of the spinning platforms and above spiked platforms. The player must hit the red switch to safely collect this coin. Star Coin 2: After the checkpoint, Mario or Luigi must find a green pipe that will take them underground to a room with the star coin. The player needs to use a springboard to reach it. Star Coin 3: Just before the flagpole, the Star Coin is buried underneath stone blocks. The player can only collect it with the Mega Mushroom.